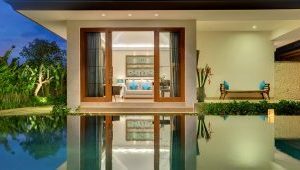 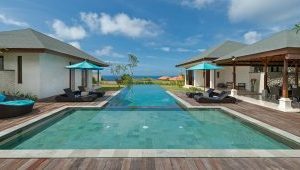 The endless 17mtr infinity pool with it’s rap around timber decking is the centrepiece of the villa and ties the main living areas and accomodation pavillions together. 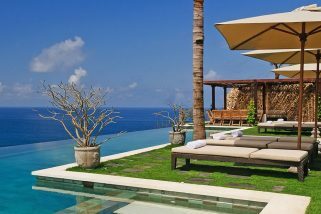 The fully air-conditioned, main dining area sits at the top of the infinity pool offering views to the ocean beyond. 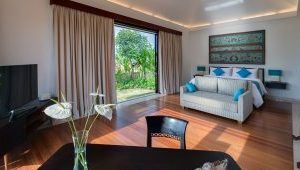 It features a modern, fully equipped kitchen, 10 seater dining table and comfortable sofas. 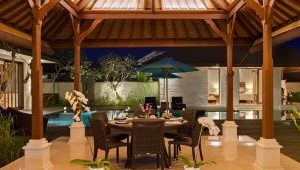 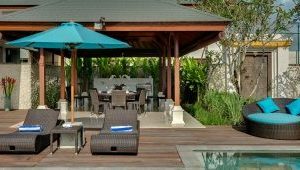 A seperate outdoor dining pavilion offers a BBQ facility and outdoor dining setting at poolside. 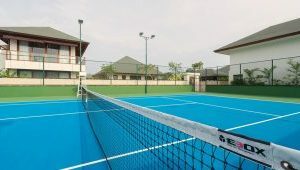 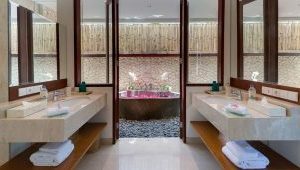 As well as having exclusive use of the leisure facilities at Villa Marie, guests have full access to the sports centre (with squash and tennis courts), spa and gym, shared with Villa Rose and The Pala. 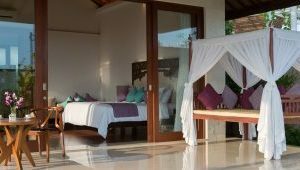 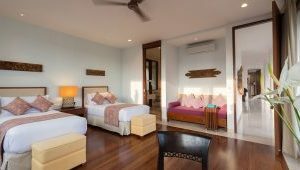 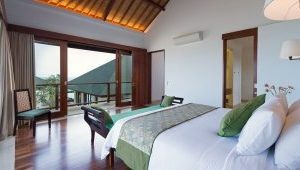 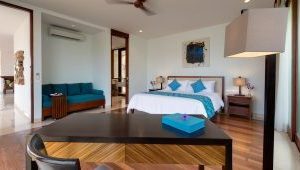 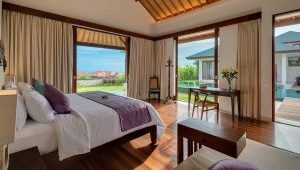 Situated behind the living pavilion is the two-storey guest bedroom building with its four bright and spacious rooms. 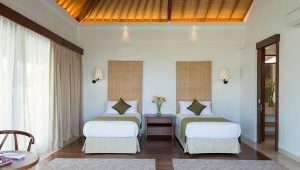 Practical accomodation, allows Villa Marie’s bedroom configuration to be altered and cater for accommodation to families, with a king and a twin-bedded room on each floor. 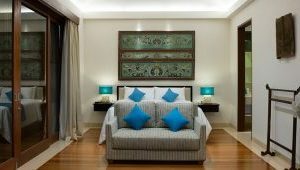 6 bedrooms with king size beds and en-suites will easily accomodate up to 12 guests. 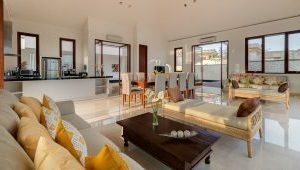 Our highly trained and discreet team of butlers, housekeepers, gardeners, security and kitchen staff all work diligently under the experienced villa manager to take care of every guest’s individual needs and two cars with drivers are on hand for those who wish to explore beyond the villa. 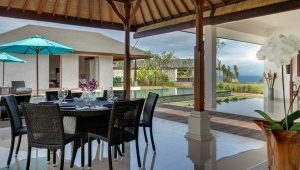 Pandawa Beach is located just below the villa and with the addition of a new road direct beach access is available to guests. 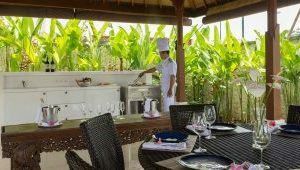 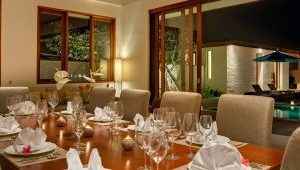 Jimbaran Bay and it’s famous seafood restaurants are a short drive away. 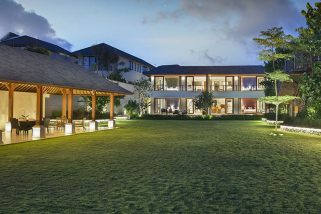 There are several of Bali’s best surf beaches in the immediate area and New Kuta Golf Club is just a driver-pitching wedge away!! 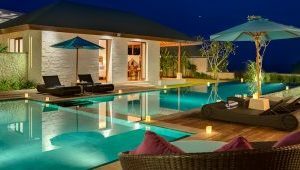 This dazzling 5 bedroom Uluwatu cliff top villa, situated on the southernmost tip of Bali has some of the best views of the Indian Ocean on the island and is a true hidden gem of luxury and peace. 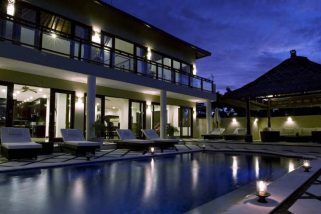 Sitting above a cliff top on the Bukit Peninsula is The Queen Villa. 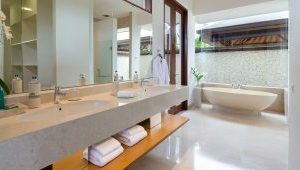 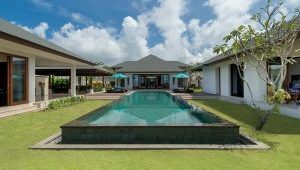 This sensational 5 bedroom Uluwatu villa is perched on the white cliffs of Uluwatu on the unspoilt, south-western tip of the Bukit Peninsula in Bali.